The Integration item of the System Profile Preferences dialog box allows you to integrate AppMon with Data Center - Real User Monitoring. Network Application Monitoring (NAM, formerly known as DC RUM) provides real-time access to information about performance and usage of key business applications. Based on measurement data provided by network monitoring devices, it monitors application performance, with the purpose of detecting, identifying and solving problems. 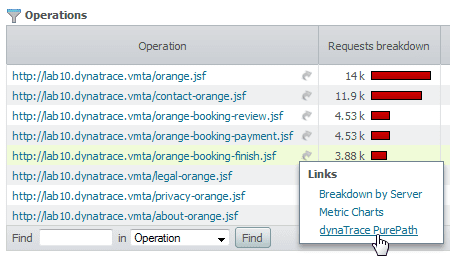 Analysis gives insight into business application performance on transaction and operation level. In combination with the in-depth analysis capabilities of AppMon PurePath technology, you can quickly find the root cause of problems in its code-level context. To combine NAM data with AppMon, configure a connection to your NAM appliances in the Integration section of the System Profile Preferences dialog box. 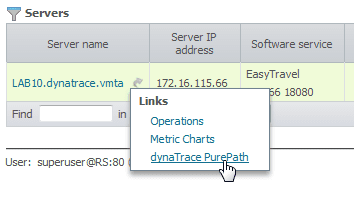 Enabling integration correlates data collected by NAM to AppMon PurePaths. NAM (DC RUM) version 12.4.10 or later. Flash installed on the client&apos;s browser. Drilldowns from the NAM Central Analysis Server (CAS) require Flash. This integration will no longer work from NAM 2019 onwards. Open the System Profile Preferences dialog box and click the Integration item. Select the Import Data from DCRUM Agentless Monitoring Devices listed below check box. URL of the DC RUM appliance. Default ports are 9090 (HTTP) and 443 (HTTPS). This field is mandatory. Username and password for the DC RUM appliance. These fields are optional. You must configure at least one DC RUM appliance to activate DC RUM integration for the System Profile you edit. The DC RUM appliance can then be configured for another System Profile. Mark the appliance you want to edit in the table. Edit the URL, username, and password associated with the DC RUM appliance. If AppMon and DC RUM are configured to inter-operate, the front end of the CAS offers several drilldown links to AppMon. Click a drilldown link and the AppMon Client starts and displays a pre-built dashboard. You have configured DC RUM Integration but the drilldown from CAS to AppMon does not work. Use the following checklist to troubleshoot the problem. Flash is required for drilldown operation. Open your DC RUM Agentless Monitoring Device, and click Test Connection. 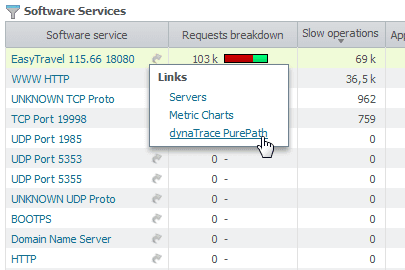 Create a new dashboard, and set its source to dynaTrace Self-Monitoring. Click Add Series and add the DC-RUM Records measure. Press Ctrl+F and search for DC-RUM to find it faster. If the value in the chart is always 0, then AppMon isn&apos;t receiving data from DC RUM. In this case, check if DC RUM is configured correctly. Contact DC RUM support if necessary. Check if the incoming DC RUM Records are attached correctly to AppMon PurePaths. 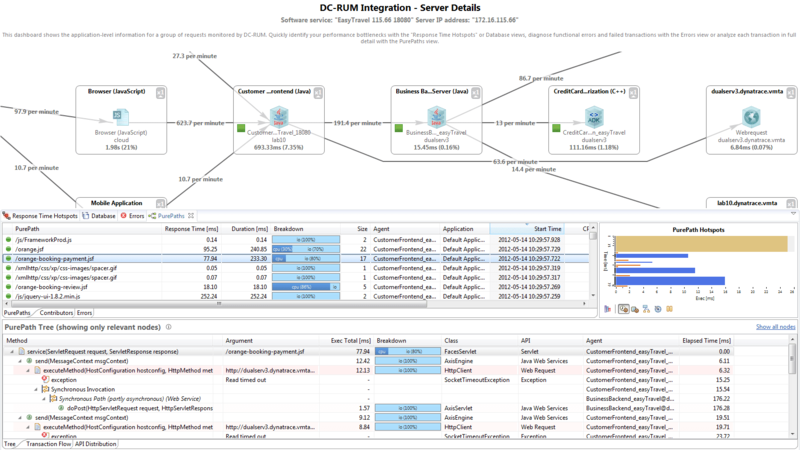 Click here to open the DC-RUM Integration dashboard using the Client REST Interface and list all PurePaths with DC RUM Records. The filter filter=dc:softwareservice? @starts in the URL template just matches all PurePaths with DC RUM Records, because every softwareservice string starts with an empty string. Additionally, you can set some other DC RUM filters. If you want to see only data of a certain timeframe, add a timeframe filter. See REST Filters for more information. If all previous checks succeed and the DC RUM Integration dashboard is still empty, AppMon may not have data for the specified timeframe. Go to the CAS and check the analysis timeframe. make sure that the data for the corresponding timeframe is stored within AppMon. If not, select more recent timeframe in the CAS before you drill down. AppMon 2017 May In the AppMon Client, right-click your System Profile and select Details. Check the Recording field of the Details dialog box. 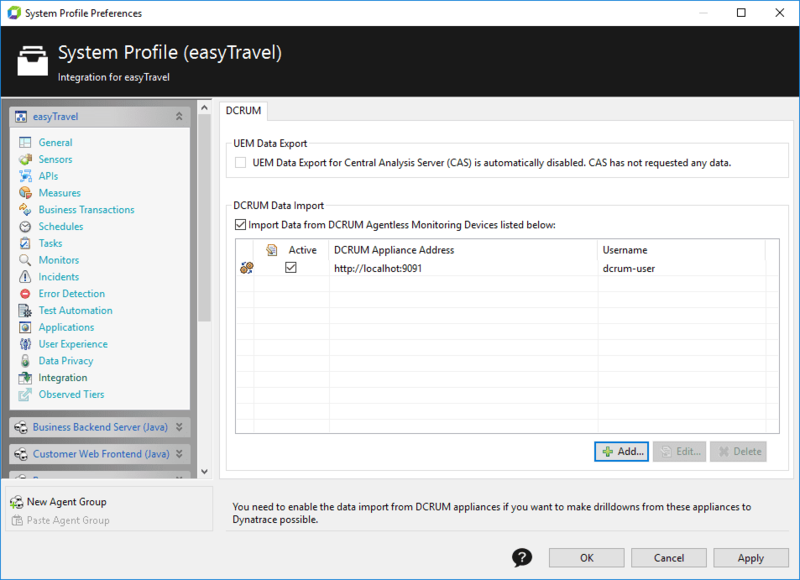 AppMon 2018 April and later In the AppMon Client, click Manage System Profiles in the Session selector. In the System Profiles dashlet, check the Recording since column of the table.